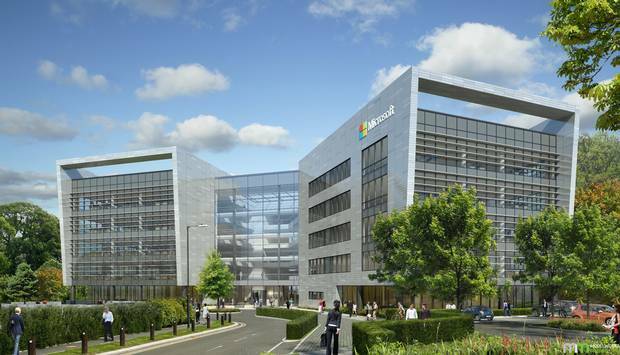 Today, Microsoft Ireland broke ground on its new €134m (about $152 million US) campus in Leopardstown, Ireland. The new campus is located on the southern side of Dublin and just down the street from Microsoft’s current main office in Sandyford. Ireland has become an important part of Microsoft’s operations. And their commitment and continued investment in its Irish operations is almost certainly welcomed news to the Island nation that has been struggling with high unemployment rates and low property values since the global recession began in 2008. For some quick background, both pre and post recession economic growth in Ireland has been intrinsically linked to many foreign companies setting up shop there. The resulting phenomenon of rapid foreign direct investment during the 1990s and the mid-2000s made Ireland known as the “Celtic Tiger,” akin to the Tiger term attributed to fast growing Asian economies of the same time period. Much of that growth was directly attributed to Ireland’s very favorable corporate tax rate and the nation’s membership in the European Union, as well as its growing tech community and highly educated workforce. But as Microsoft points out, today’s groundbreaking also celebrates the company’s 30-year history in Ireland. The country is also where Microsoft setup their first Data Center located outside of the US. Notably, as we reported last month, that Data Center has also become the center of a U.S. Federal Court case in which Microsoft is withholding private email data from US investigators. Microsoft is keeping this information from US authorities on the grounds it is unlawful and an invasion of privacy, in the hopes that US lawmakers will clarify the issue. In total the new campus will be over 370,000 square feet of office space on a wooded 7.4 acre campus that should be an impressive new headquarters for Microsoft’s sizeable Irish workforce. What do you think of Microsoft's investment in Ireland?